New for version 1.1 (currently in design and soon to be available on the App Store) is a full MPE Calculator, covering wavelengths from 180nm through to 1mm. This will be available as a free update to all users of the Laser Safety App. Direct exposure to laser light can be harmful to eyesight and normally care should be taken to avoid doing so, especially if the user has little experience in assessing the risk. 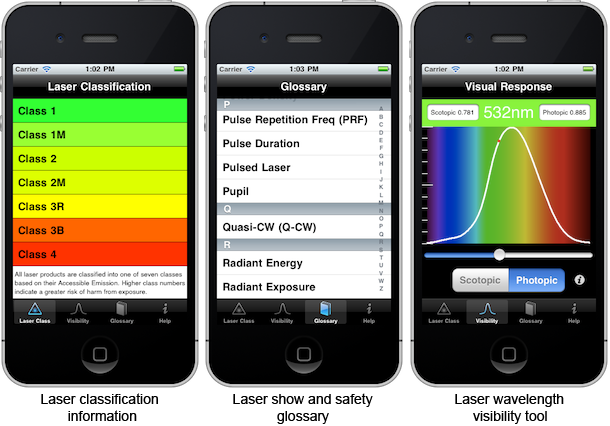 Laser Safety App is provided as tool to aid those competent in assessing laser exposure risk, and should be used alongside other assessment methodologies, not as a substitute.